TOM TOM CLUB: TOM TOM CLUB: 1981: 4 STARS OUT OF 5 STARS: VINYL: The Tom Tom Club was formed by The Talking Heads members- husband and wife team of Tina Weymouth and Chris Frantz. I bought this album on word of mouth. I hadn’t heard a song from it but I had read something praising “Genius Of Love” and I was a Talking Heads fan so I rushed out to get it. “Genius Of Love” is one of my favorite songs from 1981- it peaked at #31 on the Billboard Hot 100. Both “Genius Of Love” and “Wordy Rappinghood” topped the US Dance chart. The Tom Tom Club have released six albums over the years- this is the only one I own. A good one. LINDA RONSTADT: LIVING IN THE USA: 1978: 3 1/2STARS OUT OF 5 STARS: VINYL: This album was the first album to ever ship double platinum in the US. I listened to Ronstadt’s follow up album a couple weeks ago “Mad Love” in which she tries to adjust to the changing musical tide and go “New Wave”- and it was very spotty. She did better on this one which was kind of the traditional Ronstadt album. “Back In The USA” and “Ooh Baby Baby” covers of Chuck Berry and Smokey Robinson songs made the Top 40 but neither was the big smash Ronstadt usually had up to this time. Music was changing and I can see why she would gamble with “Mad Love” two years later. GEORGE HARRISON: ALL THINGS MUST PASS: 1970: 5 STARS OUT OF 5 STARS: IPOD: Is this double album the best album released by a former Beatle? It has to be on the Mount Rushmore of Ex-Beatles albums at the very least- along with Paul’s “Band On The Run” and John Lennon’s “Plastic Ono Band”– I am undecided on the fourth one at the moment- maybe Paul’s “Ram” or John’s “Imagine.” This was George’s first post-Beatles album and he was overflowing with songs. Towards the end of The Beatles he would be allowed a couple songs on each album but at this point the late blooming songwriter was on par with the heralded Lennon-McCartney. I have always thought the two best songs on Abbey Road- were the two George songs- ‘Something ” and “Here Comes The Sun.” Anyway- George at this point had enough songs or a double album. “My Sweet Lord” which is probably the most famous George solo song is on this one. It went to #1. I have read somewhere years ago- I think in Dave Marsh’s Book of Rock Lists- it had “All Things Must Pass” on the list of Most Boring Classic Albums. I have never found it boring. Long in length but not boring. The song “All Things Must Pass” one of my favorite George songs. Eighteen songs on this double album. The album also had a bonus record called “Apple Jam’ which I rarely listen to. 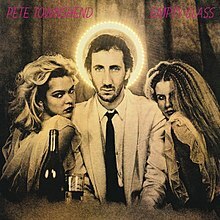 PETE TOWNSHEND: EMPTY GLASS: 1980: 4 1/2 STARS OUT OF 5 STARS: VINYL: The songs on this album were much too personal to be on an album by The Who. Pete was going though a lot of issues at this time. Keith Moon was dead, he was having problems with alcohol, drugs and his wife. I have always liked this album a great deal and have played it consistently through the years- but find it lop sided. My favorite songs for the most part are on side 1 which isn’t to say the side 2 songs are weak-because they are not. Rough Boys, I Am An Animal, Let My Love Open The Door, Jools and Jim and Empty Glass my favorites. Let My Love Open The Door was a hit in the US- peaking at #9. 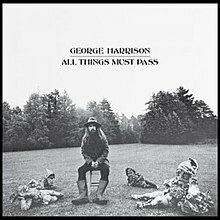 Totally agree that “All Things Must Pass” is George Harrison’s best solo album. As for McCartney, I would probably go with “Band On The Run” as well. I also like “Wings Over America,” though one could argue this record is more of a greatest hits compilation live and as such, it’s an apples to oranges comparison! As for Lennon, I find it more tricky, since he has songs on each of his solo albums I dig. On “Imagine,” the timeless title track and “Jealous Guy” are my favorites . Believe it or not, I also like the “Double Fantasy” album despite Yoko’s songs, especially “Starting Over”, “I’m Losing You”, “Woman” and “Watching The Wheels.” I can’t deny there might be a certain bias, since it was his final album. I remember the day Lennon was shot. I was still living in Germany and was supposed to have a guitar lesson in the afternoon. My guitar teacher, who was a huge Beatles fan, was close to tears when he got to my house. I had not heard the news yet. We switched on the TV right away. If I recall it correctly, we didn’t have a lesson that day! That day seems like it just happened and it’s been nearly forty years. I can remember that day very clearly- the entire day leading up to hearing the news while watching Monday Night Football. … I find it hard to judge the “Double Fantasy” album due to its release before the assassination. I do like John’s songs on it- “Watching The Wheels” one of my favorite John songs. My wife whose music taste generally is very different from mine loves “Watching the Wheels” as well!